Now Playing Song Data on your Wordpress Website! The MetaRadio WordPress Plugin has now been released! 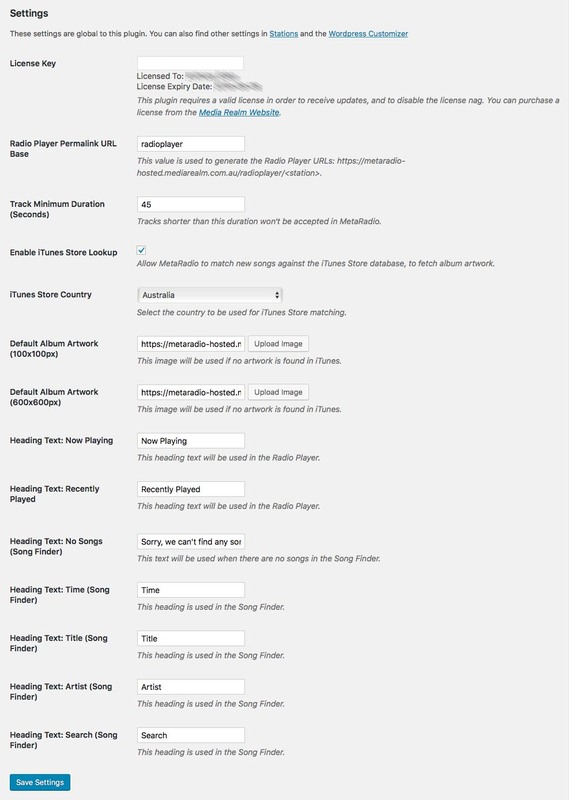 The MetaRadio WordPress Plugin is a first in the radio industry – you can now connect a wide range of radio automation systems directly to your WordPress website, allowing you to send Now Playing Song Data directly to your website! This article shows you how to setup the MetaRadio WordPress Plugin on your website. To see the MetaRadio WordPress plugin in action, visit our demo site. Before you begin, please purchase a license for “MetaRadio + WordPress Plugin“. When you purchase this plugin, you will be sent a ZIP file (WordPress Plugin) and an EXE file (MetaRadio Standalone). 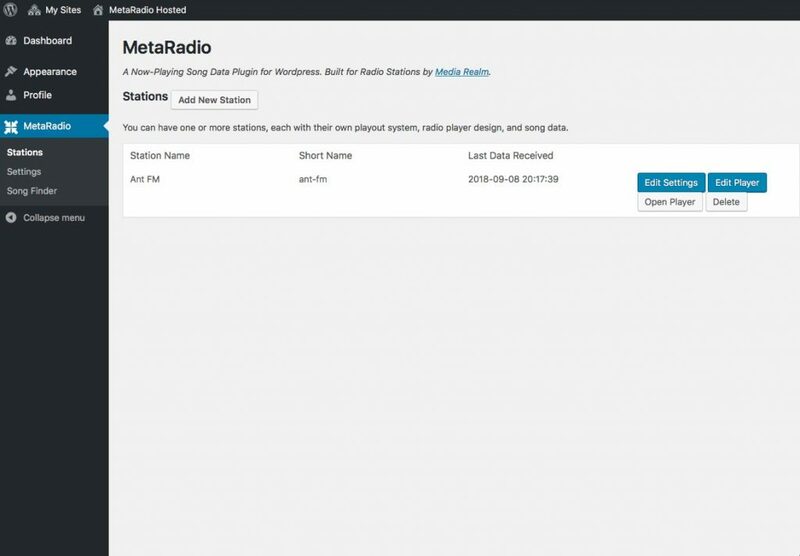 MetaRadio for WordPress works hand-in-hand with MetaRadio Standalone – a desktop app used to connect to your playout system. Before you begin, please download and install MetaRadio Standalone, and connect it to your playout system. You also need a WordPress website, where you have ‘Administrator’ level permissions, and the ability to upload and install plugins. If you use WordPress Multisite, you will need ‘Network Administrator’ or ‘Super Admin’ permissions, and the ability to upload and install plugins. Please note: Once installed, you have the options of assigning the custom user role ‘MetaRadio Manager’ to allow other users to edit the settings in MetaRadio, but nothing else in WordPress. Administration privileges are only required for the initial installation and setup. Now that you’ve installed the plugin, we can move on to basic configuration. If your license was accepted, your license name and license expiry date will show at the top of the page. Now that you’ve got the basic settings setup, we can now configure our first radio station. 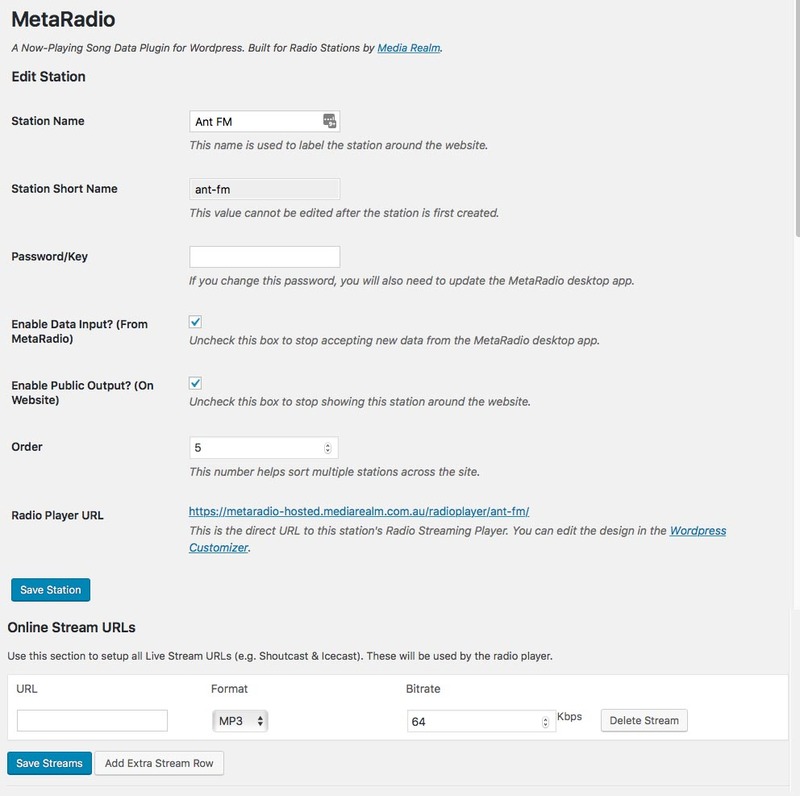 In the main WordPress Admin menu, navigate to MetaRadio > Stations. Click the button “Add New Station”. Enter a name for your station, and make up a secure password (do not reuse an existing password, as it will be stored in plain text). A Short Name will be automatically generated, but you may wish to adjust it as required. This screen, after creating your station, shows you connection details for MetaRadio Standalone. It also shows you list of Shortcodes and CSS Classes you can use anywhere on your WordPress website. You have now configured your first station, and we are ready to connect it into MetaRadio Standalone. This section assumes you’ve already configured MetaRadio Standalone to connect to your radio automation system. Now you’ve got your first station configured in the MetaRadio WordPress Plugin, you can start using some special WordPress Shortcodes around your site. These shortcodes can be embedded in pages, posts, widgets, within your theme, and within other plugins. This shortcode embeds the current song title onto your site. This shortcode embeds the current song artist onto your site. This shortcode embeds the current song album artwork onto your site. The size parameter is the number of pixels high and wide you want the image. MetaRadio also provides some handy CSS classes. You can use these anywhere on your site. Elements that use this class also need the attribute data-stationid=”1″. MetaRadio WordPress Plugin provides an in-built radio streaming player. You can configure this via the WordPress Customizer. You can include this code snippet within your functions.php file, and then include your player code in a new file called ‘player_template_custom.php’. Explaining how to customise this player template is an advanced topic, and you will need WordPress development experience. Media Realm is able to provide advanced player customisation services (for a fee). Please get in touch to request this service.